The pollutant effects of fuels such as petrol and coal, especially the harmful gases released to the atmosphere such as carbon monoxide, nitrogen oxides and sulphur oxide. In order to reverse this damage, researchers seek bio-based alternatives that provide a recycle and inexhaustible source of energy. However, the use of organic raw material as energy source has some problems regarding its effective use. 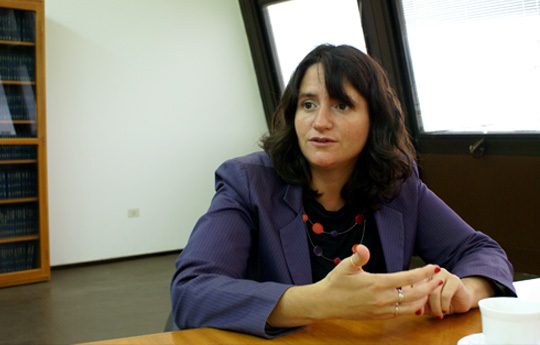 Selva Pereda, CONICET independent researcher at the Planta Piloto de Ingeniería Química (PLAPIQUI, CONICET-UNS) [Chemical Engineering Pilot Plant], leads a non-conventional Biorefineries and fuels group. She affirms that that in recent years, there was a boom in the production of fuels from biomass and explains that her team studies alternative technologies for the production of biodiesel because the conventional ones are pollutant and have low performance. “Our team is devoted to the study and development of pressure intensified technologies known as supercritical technologies. We aim to conduct more efficient processes by using non-polluting solvents, trying to consume less energy and harnessing the biomass comprehensively. In the case of biodiesel, we have developed a technology that allows using cheap raw material without pollutant catalysts and does not demand large volumes of water for the process. The team was created based on this philosophy: to make responsible and sustainable use of biomass”, Pereda states. In Argentina, there are several biodiesel production plants that work with imported technology and with other smaller-scale technology that can hardly be efficient. As regards this, the team also develops tools based on mathematical models useful to improve the operation of equipment installed currently such as biodiesel dry wash column. “We are an applied thermodynamic group, we analyse the processes from the point of view of its scope and power consumption. Our team is interested in biodiesel as well as in the development of models to describe the mixtures of fossil fuels and biofuels, blends, whose properties are logically different from the original fossil. We study that and the production and purification of nitrogenous fuels”, the researcher adds. The biodiesel is produced by means of a chemical process called transesterification, through which oils are combined with alcohol to create a reaction that produces esters of long chains and high molecular weight. This method is the most common to produce biofuels and it is the one that cosmetic companies use most because this type of esters are the base for many of their products such as creams, detergents, shampoos, etc. Pereda explains that one of the most important companies devoted to this activity in the world is interested in supercritical technology and has hired projects to test it. Likewise, the scientist explains that in order to obtain high performance, the commercial biodiesel is produced from refined oil. “It is the same that is available in supermarkets, and for this reason it is expensive raw material. Unlike this, supercritical technology allows us to use unrefined and residual oils. For this reason, we have created consortium with the Municipality of Bahía Blanca and public transport companies so as to recycle the oil used by large restaurant chains. We would like to develop a pilot prototype, and if that works fine, the idea is to process the residual oil of the great Argentine cities”, she says. Furthermore, the researcher commented that after a private organization’s enquiry about the recovery of entrained oil in soybean lees and byproducts of refining, they decided to undertake a project applying all supercritical technologies. Later on, that was the beginning of a new line of research in the group. “Transference projects are interesting because they provide knowledge for the society and they also guide our work in areas that are in demand and have needs outside the academic sector. I would like to highlight the example of a study that began after a project with little money and took two months. In the future, if a company is interested in that knowledge, we would be able to provide an answer that we did not have before the initiative. Today, we have completely alternative technology to offer”, Pereda concludes. There is a great variety of raw material to extract value added compounds but it is hard to take them from natural products. In general, the processes through which essences and aromatic products are obtained, take place at low pressure and use organic solvents cannot be used in certain pharmaceutical or food products, so they have to be excluded from the natural product in question, thus generating an associated cost. This could be avoided by resorting to the use of technology intensified by pressure, through processes known as supercritical extraction and fractionation, that is to say that they occur at high pressure, use gaseous solvents and do not let residue in the product. Pereda adds that it is remarkable that these processes can take place at room temperature so they do not denature complex bioactives, a vital element for the quality of the final product. “Currently, we are asked about transference of linalook, an essential oil present in citrus that due to its perfume is used in aromatic products and as flavouring. There are people who are interested in it but we still have to get to the first step, which is a major investment. The greatest difficulty is that small producers work in the extraction of essences and aromatic products do not have the same investment capacity for this type of technology we offer, in which a better quality product is obtained but it is more expensive”, Pereda says. Actualmente nos consultan para hacer transferencia en el tema de concentración de linalool, un aceite esencial presente en cítricos que por su perfume es utilizado en productos aromáticos y como saborizante. Hay gente interesada pero todavía nos falta conseguir dar el primer paso que es una inversión importante. La mayor dificultad es que los pequeños productores que trabajan en la extracción de esencias y aromáticas no siempre tienen capacidad de inversión para este tipo de tecnología que ofrecemos, en las cuales se obtiene un producto de mayor calidad pero es más costoso”, dice Pereda.